This is It, the "King Kong” of Slot Car Tracks! With more track pieces, more track length, more levels, more banks, criss-cross tracks, squeeze tracks, sheesh! There just isn't another track like it. The Giant squeezes an amazing amount of action into only 4' x 8' of floor space. And the Giant is the only HO scale set to come with a digital Lap Counter. That’s right, only AFX has a full blown electronic Lap Counter and it comes in the Giant set. Not only does it count up to 99 laps, but it starts your race with a 5 second count down. But don’t jump the start or you get penalized 1 lap! Super easy to set up and operate, the AFX digital Lap Counter brings a whole new level of fun to slot racing. And only AFX has it! 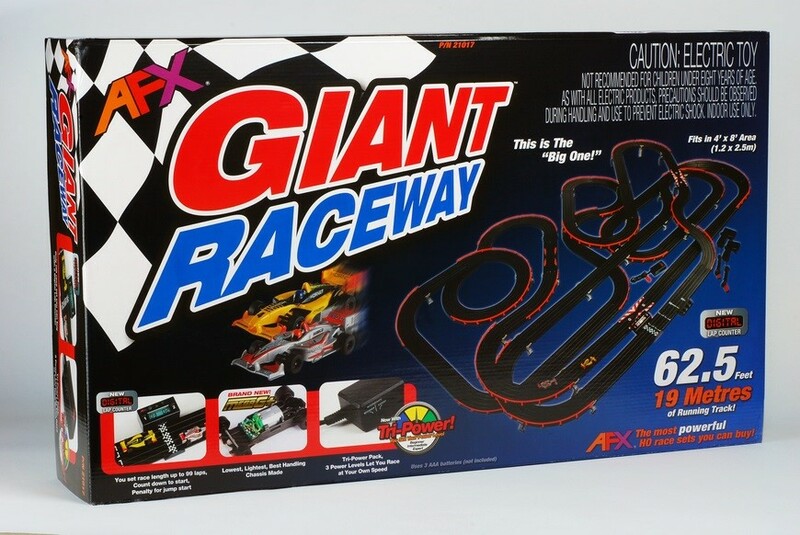 And now, like all new AFX sets, the Giant incorporates the Mega G+ Race System: the easiest slot car system to learn and the easiest to drive at the limit. More fun guaranteed! With Tri-Power Pack and Mega G+ parents can race with their younger children without the child crashing all the time. And what about those birthday parties when you have a lot of children with different skill levels? The Tri-Power Pack lets them race and race and all the players get to enjoy themselves.